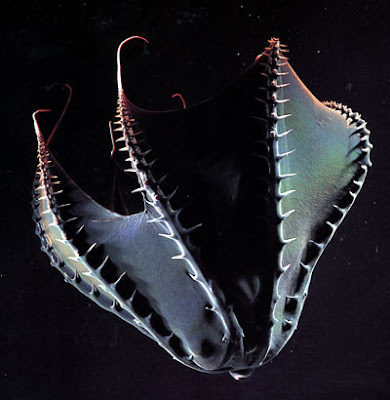 One speculative explanation for the secret of their success is the ability of some members of the cephalopod clade to survive in cold, nearly anoxic conditions, like Vampyroteuthis infernalis. They were able to rebound quickly because of their dismal metabolism and the general fecundity of cephalopods. They restored some ecological webs faster than previously thought and provided an environment for further growth of more severely crippled clades. It just goes to show you that our current episode of global warming is a relatively minor event. Life will go on. Fast-living organisms with high metabolic demands like, say, humans, might suffer and die from the environmental consequences of a high CO2 atmosphere, but don't worry — the cephalopods will live on. They might even get a happy surge in numbers from the changes. -- Pharyngula notes findings that ammonoids exploded in diversity and radiated rapidly after the Permian extinction, when 'life nearly died' (see also NYT report).